Family game night is a great book. It’s kind of has a different plot then a lot of books.It would be scary to live in a house like that. I think 4th and up should read this. 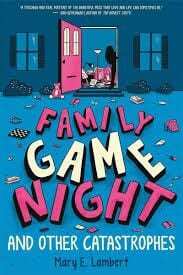 Family Game Night and Other Catastrophes is a funny and dramatic tear jerker about Annabelle and her family. Throughout the book Annabelle learns about how everyone is broken. Her sister Leslie has terrible anxiety and nightmares. Her father, brother Chad, and herself all are responsible for running away when life gets tough. Her grandmother is a terrible control freak and Annabelle’s mother is, well, a hoarder.